The Kendrick is now open for tours. Call our leasing team or sign up through our website to schedule your tour today. *Select apartments only. Valid 4/1/2019 - 4/30/2019. Restrictions apply. See leasing team for details. A Home for Art’s Sake. It’s no coincidence that The Kendrick’s tagline is “Made You Look”, because there’s plenty to see inside of this exciting new apartment community. 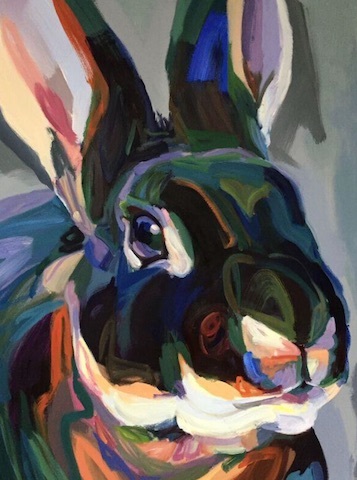 Just moments into your introduction to the community and you’re welcomed by one of the stars of the Kendrick’s collection, a striking 5′ x 5′ oil-on-canvas rabbit that seems to beckon you into the library and reception area. Gazing into the bold, layered colors and the depth of character, you can almost see a little twitch in the nose. This selection was inspired by the indigenous New England Cottontail and the symbolism of good luck and renewal with which rabbits are associated. Painted by Massachusetts-based artist Jo Hay, it’s playful, elegant and encapsulates the collection’s overarching themes, mixing natural and local, while providing a New England sensibility in an updated and fresh way. This piece is just the first of many intriguing and captivating objects that fill the spaces at The Kendrick. Boston Art’s long-standing relationships with an extensive network of local and national artists provided The Kendrick the perfect artwork to fit its unique spaces. “The Kendrick’s tagline is ‘Made You Look’, so we wanted everything to be attention-grabbing,” Hlavacek said. And the spaces do not disappoint. Step a little further into the interior and you’ll find a flock of tiny, wall-mounted golden birds that add a modern counterpoint to the natural subject and setting, while the mailroom cheekily features vintage travel books and framed vintage post cards. Another highlight of the collection is upstairs in the library. 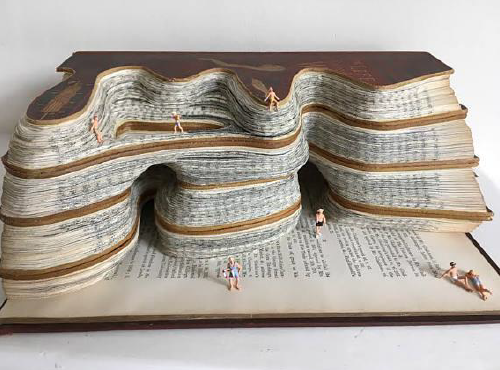 Antique and Art Nouveau books are interspersed on shelves with carved books created by a sculptor based out of the UK. Vintage books and black-and-white photographs line the walls of the media room, transporting you to the study of a stately Boston manor house. By the fitness center, framed preserved moss mixed with framed moss images dominate an entire wall, providing a forest-like respite after a hard workout. You’ll find walls of vintage mirrors, contemporary New England landscapes, modern prints full of texture and depth, and artful brass curios that perfectly accent the feel of each room, as well as a mix of objects that clearly show a reverence for the past in the context of the present. While some of the other spaces, like the kayak/bike storage area and the media room, have colorful, modern prints that give clues as to the use of the room. The overall effect of this curated experience imparts a sense of establishment, as if this brand new apartment building has been around for years. True to The Kendrick’s promise, a tour of this extraordinary community will make you look, again and again. Get your first look today by setting up your very own private tour of this jewel of Needham apartments. So many amenities, so much time.